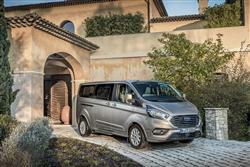 The improved Ford Tourneo Custom is a smart-looking, well-equipped and economical super-large People Carrier that can seat eight or nine. If you've progressed beyond the normal seven-seater MPV, this could be the perfect left-field choice. Now it offers the option of clever mild hybrid engine technology too. Ford has a reputation for making some of the best people movers in the business. B-MAX, C-MAX, S-MAX and Galaxy all have their firm adherents but sometimes there's just no substitute for size. Sometimes, buyers need a size beyond what even a Galaxy full-size MPV can deliver. If you're doing some heavy hauling and need a vehicle to fit that particular bill, the latest Tourneo Custom with its smarter styling and more efficient EcoBlue engines could be the answer. This contender offers generous space and reasonable comfort for up to nine people beneath an exterior that while not doing too much to disguise its commercial vehicle roots, at least now looks as if it's been designed rather than arrived at. The Tourneo Custom is designed to be cost-effective for business use or as a safe, luxurious way of carrying family, friends and all their stuff and you can even opt for an L2 long wheelbase version if you've never really got round that 'people or luggage' predicament. Whichever Tourneo Custom you choose, if you pop the bonnet you'll be greeted by a 2.0 litre EcoBlue diesel engine, mated to a six speed manual transmission and driving the front wheels. So far, so simple. After this it gets a little more involved but nothing that'll require homework. There are three power levels to choose from - with 105, 130 or 185PS options. The 130 and 185PS variants can be had with the option of 48-volt mild hybrid technology. Engine refinement at idle still isn't class leading, but you'll never be kidding your passengers that they're in a Lexus anyway. There's the option of a six-speed SelectShift automatic transmission, plus a unique-to-segment rear air suspension system that delivers a supple, controlled and level ride across a wide range of load conditions. There's also the option of a plug-in model hybrid based around 1.0-litre EcoBoost petrol power. The chassis has been meticulously tuned for British conditions with beefy front and rear axles, bringing excellent levels of stability and control. The ultra-stiff body structure allows the suspension to do its work effectively without the usual van-like intrusions. There's even Torque Vectoring Control which reacts to the road surface 100 times per second. Using this information, it balances the amount of power delivered to each of the two front wheels, maximising grip and sharpening handling. And you thought all that was just for sports models. This revised Tourneo Custom has a bolder front-end appearance that shares the same design DNA as Ford's latest passenger cars, with a high-mounted trapezoidal grille and dynamic, slim headlamps that flow neatly into the vehicle's muscular shoulder line. Inside, there's a re-designed instrument panel which offers an attractive, user-centric layout influenced by consumer interactions with smart devices and tablets. 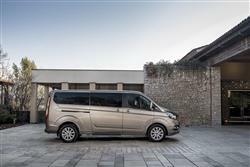 To provide customers the ultimate flexibility in configuring and using the rear cabin, the Tourneo Custom is the only vehicle in its segment to offer six individual rear seats, with the ability to arrange the two rear rows in conference format for enhanced interaction between passengers. Or you can set the cabin up with two rows of three seats facing forward. Standard on high series models, the six individual seats can each be folded flat, tumbled, stowed in a multiple locations or removed completely to maximise the luggage area or meet special business or lifestyle requirements. 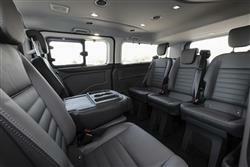 You can have your Tourneo Custom configured as an eight or nine-seater. Either way, you can also choose an L1 (short wheelbase) or an L2 (long wheelbase) version. The L1 version is 4.97m in length, while the L2 is 5.34m. The L2's extra 370mm translates into extra luggage space behind the third row of seats. As a result, with all the rear seats removed, it offers up to 6.8 cubic metres of luggage space, compared to the L1's already generous 6.0 cubic metres. Because it's less than two metres in height, the Tourneo Custom fits within most car park limits. Prices start at around £35,000 and as before, the line-up continues to also offer both eight or nine-seat configurations, with a choice of short wheelbase and long wheelbase versions. The longer model provides additional luggage space behind the third seat row. If you want a plusher package, this MPV is available with an upscale 'Titanium X' package that includes leather trim, Ford's SYNC 3 infotainment system with satellite navigation and rear view camera, plus HID Xenon headlamps. For customers seeking a more dynamic exterior appearance and a more stylish sports interior, a 'Sport' series is also available. This package combines the 185 PS engine option, a full exterior body kit with twin bonnet stripes and unique 17-inch alloy wheels, alongside partial leather interior trim. This improved Tourneo Custom introduces 'FordPass Connect' on-board modem technology - standard for both the 4-inch and available 8-inch touchscreens. This enables each occupant to benefit from Wi-Fi connectivity, and a range of features can be accessed via the FordPass mobile app. These aim to make the vehicle ownership and operating experience easier and more productive, including Vehicle Status access, a Vehicle Locator, a Remote lock/unlock function and, for automatic variants, Remote Start. The big change with this revised Tourneo Custom model is the introduction of optional EcoBlue Hybrid 48-volt mild hybrid technology mated to the cleaner EcoBlue diesel unit introduced in 2018. the mild hybrid option is offered on the 130 and 185PS manual variants and has been optimised to enhance fuel efficiency. The 185PS mild hybrid variant manages up to 183g/km of CO2 and up to 40.3mpg on the combined cycle - both WLTP-rated figures. So how does it work? Well, a belt-driven integrated starter/generator (BISG) replaces the standard alternator, enabling recovery and storage of energy during vehicle decelerations, and charging a 48-volt lithium-ion air-cooled battery pack. The BISG also acts as a motor, using the stored energy to provide torque assistance to the engine under normal driving and acceleration, as well as running the vehicle's electrical ancillaries. The EcoBlue Hybrid's advanced Auto Start-Stop technology operates in many situations, including when the vehicle is stationary in gear, and when the vehicle is coasting to a stop. The driver can adjust the coasting speed at which Auto Start-Stop operates, between 7mph and 12mph. All Tourneo Custom powertrains also benefit from a selectable ECO Mode to further reduce fuel consumption. The feature optimises the vehicle configuration and settings to maximise fuel efficiency. If you want to go further, there's a Plug-in Hybrid model based around 1.0-litre EcoBoost petrol power mated to a 13.6 kWh lithium-ion battery pack. Up to 31 miles of all-electric progress is promised - or 310 miles including the petrol engine's range. The Tourneo Custom Plug-In Hybrid can be charged using a domestic 240-volt 10-amp power supply to achieve full charge in less than six hours, or using a commercial 240-volt 16-amp or 32-amp supply to achieve full charge in three hours. Vehicle manufacturers often seem so intent on finding minuscule pieces of white space between niches that they sometimes take their eye off what can be a neglected but potentially lucrative existing sector. 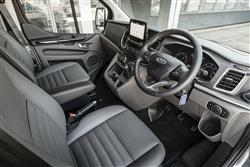 Perhaps Ford has been guilty of that in the past, but with the Tourneo Custom, it's more than making up for that. If you've needed something that's bigger than a Galaxy but don't want to spend getting on for £40,000, there's really not much on offer above humble crew bus fare. The Tourneo Custom has changed that and significantly improves its proposition in this updated form, offering a vehicle with a bit of style and, should you want it, some decent interior appointments. 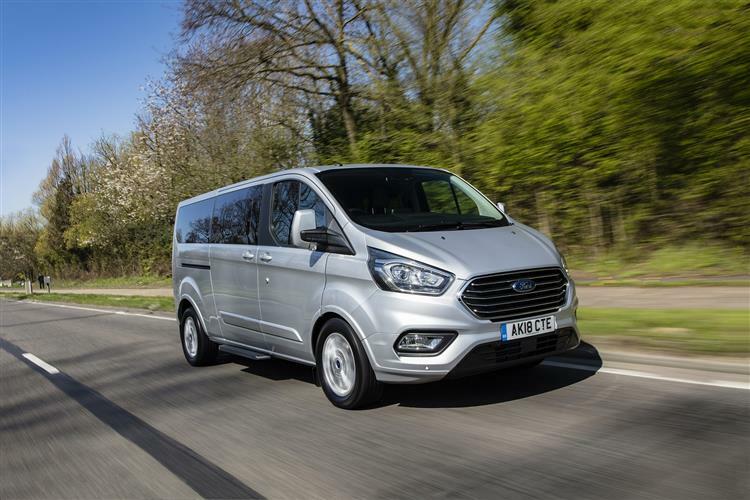 There's no shortage of space and with low ongoing running costs and the reassurance of typical Ford build quality, it's hard to see the Tourneo Custom disappointing. Perhaps Ford's biggest challenge will be in letting private buyers know the thing exists. For businesses it could be a no-brainer. For big families it could be the answer they never knew existed.